The Aqua Terra collection introduces a new member to its already distinguished family of stunning and revolutionary mechanical timepieces. The OMEGA Seamaster Aqua Terra 150M Blue Dial provides a bold and stylish touch to any wardrobe, while being robust enough to fully complement an active lifestyle. The 38.5 mm stainless steel case wristwatch features a polished bezel and domed scratch-resistant sapphire crystals with anti-reflective treatment on both sides. The brushed OMEGA patented screw-and-pin bracelet is in stainless steel and corresponds to the casebody. The transparent caseback allows a perfect view of the exceptional Co-Axial mechanical movement powering the watch. The blue dial is characterized by the lacquered teak pattern associated with the Aqua Terra collection, recalling the vertical lines found on the wooden decks of luxury boats. Applied 18 Ct white gold indexes with Super-LumiNova match the central hour, minute and seconds hands, which have diamond-polished sides and white Super-LumiNova for easy reading in all lighting conditions. The officially certified chronometer features a date window at 3 o’clock as well. This prestigious timepiece is powered by the OMEGA Co-Axial calibre 8500 – one that has re-defined mechanical watchmaking. It features an escapement with three levels, and includes OMEGA’s exclusive Si14 balance spring on OMEGA’s free sprung-balance system. The time zone function makes it possible to adjust the hour hand by itself without affecting the minute and seconds hand, a feature that caters to the traveler who frequently changes time zones. The technology within this timepiece is so reliable and precise that it comes equipped with a four-year warranty. 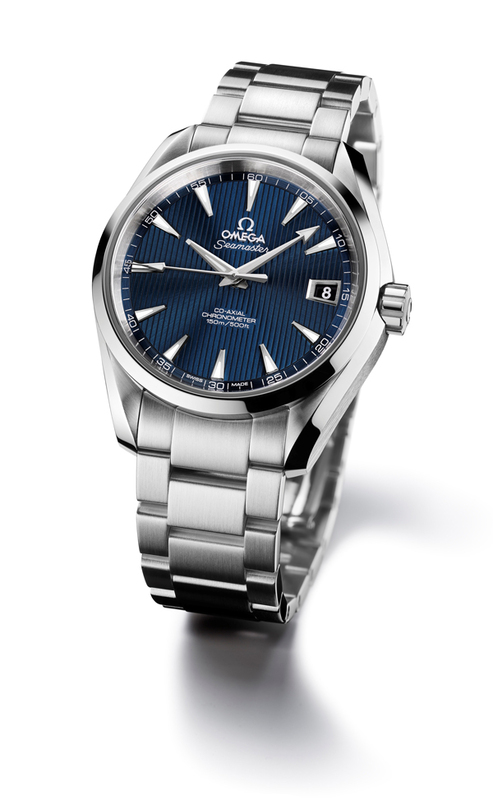 The Seamaster Aqua Terra 150M Blue Dial is water resistant up to 15 bar / 150 metres / 500 feet.